Zoran Obradovic was born in Sarajevo, Bosnia. He moved to Buffalo, New York, when he was a young teenager. Attending Niagara University, he studied communications, international studies, and peace and social justice. He received a master's degree in informatics from the University at Buffalo. Zoran is an avid reader, traveler, and practitioner of martial arts. 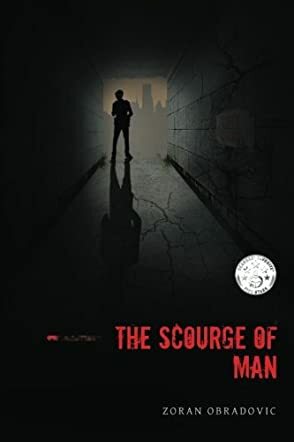 The Scourge of Man by Zoran P Obradovic is a gripping story with a dystopian edge, great characters and a lesson that touches powerfully on the human spirit's quest for happiness. Vincent is a depressed man who has lived on the fringes of society, feeling restless and desperately seeking a purpose. This is why he just moved to New York City, hoping his life could take a new course, but when he begins to feel comfortable in his new environment, all hell breaks loose and the city is devastated by a catastrophe no one saw coming, and none can escape the consequences. As the city begins to recover from the calamity, a new way of life springs forth and Vincent finds both love and a purpose. But the events that unfold in this new city compel him to take justice into his own hands, becoming a legendary figure who is feared in some quarters and revered in others. But deep within the desperate man turned the scourge of the city is the vulnerability of a man looking for love and a deeper life. Can he find answers for his questing soul or will he be driven deeper into the darkness that beckons him? What arrested my attention as I started this novel was the beauty of the prose — friendly, fluid, and captivating. The author has the gift of feeding the reader’s insights with beautiful images of the setting and I also enjoyed his ability to show the emotions in the characters. Vincent is a symbolic character whose quest echoes the dying cry of every human soul for a life of meaning and inner freedom. The setting is one of the best I have read in this genre and it is hard not to imagine it in one’s mind. Zoran P Obradovic’s The Scourge of Man will captivate readers and compel them to see the arid climates of their souls even more. It’s deft and balanced, utterly engaging. The Scourge of Man by Zoran P. Obradovic reveals the new Batman/Robin Hood (of sorts). The novel follows Vincent as he is trying to rebuild his life in a place that promises great opportunities. He had moved to New York City in the hopes of starting over and, for some time, he actually feels good in this new city. However, when tragedy strikes, his world comes crashing down. But a new civilization is emerging once again and Vincent finds a new normal. He finally has what he always wished for; he has a normal life and he has love. However, his life and his resolve are tested once again when the injustice of the newly rising world tests him. He is now forced to take on the identity of a Scourge. He breaks into the wealthiest of houses and takes what should have been given to the people who needed it in the first place. He becomes a legend, the man who is loved and feared at the same time. But what will happen to him? What about his own dreams and hopes? The sheer artistry behind Zoran P. Obradovic’s words is amazing. I was lost in the story and in Vincent’s progress. However, more than that, I become one with Vincent. I was so deeply enamored with him that I could see what Vincent was seeing and live what he was living. The new world is perfectly imperfect and Mr. Zoran created a new world that is believable and scarily realistic. This is a fast paced novel that takes you on a journey with the lead character and you won’t want this journey to end. Finely crafted and supremely creative. I found this book really intriguing and captivating. What I really liked is the fact that once I started reading it I just kept wanting to know more and more. The description of scenes and actions is very vivid and many nights I ended up going to sleep way to late because I just couldn't put the book down. I am actually very interested in reading more books by this author.